Michelle Christian with her son Tyler and her daughter Chelsea. I have a son, Tyler, who was born with a rare syndrome, Prader-Willi. It is a medical condition along with severe cognitive delays. He is missing part of chromosome 15. The most difficult part of PWS is uncontrollable hunger. The hypothalamus never receives the message of fullness. Combined with no ability to throw up, it is very dangerous for him to have access to food. He could rupture his stomach. He is supervised at all times to prevent food seeking. We also lock up food at home. Dog food, trash food, fridge and freezer. I’ve added door and window alarms to prevent escape when Tyler searches for food. He has been age tested at 7 to 10-years-old mentally. He is 19-years-old. 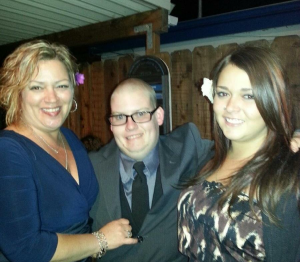 Last November, Tyler was able to get out of the house at night, without his caretaker knowing. I reported him as an at risk missing person. We spent the entire night looking for him. Tyler apparently took some food from a neighbor’s house and walked all night. Tyler has been to county mental health before and another patient told him that if he doesn’t like the rules at home, he could just be homeless. He doesn’t have the cognitive skills to understand this is not the right thing to do. He went through an unlocked sliding glass door of a home, and took a sleeping bag and other items so that he could be homeless. He was caught and arrested and spent a week in solitary at the county jail, because they did not know how to deal with his condition. Also, for his safety, due to his small size and the fact he would do anything for food. He also had no shower for the time. We have been going to court once or twice a month since. The San Luis Obispo County District Attorney’s Office will not back down in charges even though the person that Tyler took the items from got everything back and they don’t wish to press charges. The prosecutor wants to charge him with a felony and give him a strike, meaning that, if he stole again, he could go away for 16 years. Two doctors have taken the stand in a preliminary trial stating it would be fatal for him to be incarcerated. His trial is set for Oct. 6. I have been trying to find a group home for him for years. They are very hard to find with only 19 homes in California for his specific syndrome. Each home takes only four adults. There are approximately 700 affected people in California. So, there is a serious shortage of appropriate housing. We have found one in Riverside that wants to accept him and have set his move in date for next month, but not if he is having to go to court. This won’t be possible unless he pleads guilty to a felony. Tyler wants to move and it would be best for him. They can provide the structure and security he needs. I am shocked and upset that the DA doesn’t want to listen to the doctors and specialists, who all agree that this is over kill. All of the items have been returned and the home owners do not want to press charges against Tyler. I feel this is a waste of tax payers money and also, cruel and unusual punishment for a young man with an obvious disability. I am asking for the community to come together and help convince the DA to drop the charges. My son has a rare disability, he is not a criminal. Michelle Christian grew up in Arroyo Grande and currently lives in Pismo Beach. So my question is this Prader Willi a disease? If so addiction and alcoholism is also considered a disease. Many inflicted also break into peoples homes to feed their disease and condition. Is anyone accountable anymore? For ANYTHING? Obviously he was diagnosed with this years ago, This is not an overnight thing. I dont mean to sound harsh but your story seems to be missing some important information. I agree he does not belong in jail. Or maybe he does? For his own safety? Can only assume that there are some people that would not take lightly to someone entering their home in the middle of the night. There are many successful people with Prader Willi. Richard Simmons is one of them. I personally am worried about his wondering, walking into someone’s house and then having a confrontation and someone gets hurt. I think he should plead guilty but then I think his sentence should be to the ‘safe house’, not jail. That way, the mother would not be allowed to remove him and bring him back to her home which has become a danger point to neighbors and local citizens. I think it would be reasonable for his record to reflex these two incidents in the event he should get out again and there would be another illegal situation and hopefully no one gets hurt because of his cognitive level. I don’t think it proper to place this in a closet and pretend this is not a dangerous situation. Too many young people have mental or physical problems and the family wants at all costs to protect them. Look at what happened at Sandy Hook School, Colorado theatre by Mr. Homes, the young man in Isla Vista. Everyone wants to blame the gun but each of these (any many ore) young people known to their families who wanted to protect them. She is just some sexist attorney that will only take on cases where she can make a s load of $$$$$$$ and gain additional recognition to boost her ego. She would never take a case like this. She is too busy with all of Bill Cosbys past victims. For years the DA’s office has often aggressively prosecuted the disabled and mentally ill. DA Karen Gray regularly fought to have the mentally ill deemed competent so instead of going to a hospital, they went to prison. I think that over all the new DA Dan Dow is doing a good job. Hopefully, he will talk to whatever cruel and narcissistic prosecutor is on this case. Tyler grew up in the community and his teachers, caregivers and neighbors know what a sweat person he is. Hopefully the exposure helps bring some humanity into the actions of those few DAs who have none. Maybe DA Karen Gray had some experience with criminals that committed violent felonies, and even murder and used the mentally ill route to avoid prison and spend a few years in a treatment facility and then walk our free and clear, we have all seen this happen too often. This might explain her some of her actions. The da is a thief – the pos has to be tough on no or low level crime to justify crime stats so he can thieve his salary. Ya ever heard the saying that there are 3 sides to every story? My side, your side and the TRUTH? Tough situation, what does your atty have to say? Hoping DA will back down on charges. I am raising him. Yes my daughter lives with me. The level of care he needs is very difficult to manage. . Good help is hard to find. He wants to go to a group home. It’s moving on for him. I will look into change.org. Thank you. I would suggest you write a petition on change.org , as many of these are very effective for calling attention to your situation. You could use an edited version of what you have stated here. Then you could post it here for us to sign. He most obviously should not be incarcerated and I for one am more than a little irrate that our tax dollars, law enforcement resources and courts time are going towards this sort of thing. Michelle – Just curious because I’m not walking your path but why aren’t you raising him? Does your daughter live with you? It is likely they may be employed or in school, and the young man needs near-constant observation. This is never convenient nor cheap. Back in the day when we would have family around, a retired grandparent or aunt, etc. could watch. Today, we’re often spread thing, family-wise, and the multi-income household went from unusual to mandatory. Hence the need for care homes. It must be a living hell to never feel full. Coupled with an inability to purge, this is a very dangerous thing, health-wise.